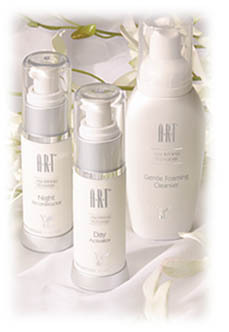 The future of skin care is truly a work of A-R-T. The newest DNA recovery technology with the latest collagen enhancing ingredients, create a formula that can combat the visible signs of aging at the cellular level, renewing younger-looking skin. A superior concept in skin restoration, Young Living’s ART, Age Refining Technology, combines DNA recovery enzymes – an advanced technology – with a proprietary Anti-Aging Peptide Complex, to reduce the look of fine lines and wrinkles, diminish age spots, even skin tone and increase the elasticity and density of your skin. What’s more, recognizing the incredible power of essential oils, Young Living has added Frankincense and Sandalwood for their ability to support and sustain the skins ability to renew DNA and revitalize skin. Add the incredible power of the legendary Wolfberry Seed Oil, known for its superior moisturizing and skin conditioning properties, and you have the formula for a truly unique and effective skin care system.